If I am ever murdered and I get to choose the pathologist to perform my autopsy, I want it to be Dr. Siri Paiboun, the main character in The Coroner's Lunch. Author Colin Cotterill has created a good man living in difficult times. The year is 1975 and Laos is now communist run. Paiboun, even though he is 72 and looking forward to retirement, is appointed as National Coroner. He has no budget, limited supplies and must report to an in-experienced judge who wants all results to follow the needs of the party. In his favour, Nurse Dtui is an eager assistant and Mr. Geung, while living with Downs Syndrome, functions as far more than an orderly. Early in his tenure as coroner, the results of several autopsies don't add up to the neat and tidy results the court wants. Siri realises he has to dig deeper even if it gets him into trouble. The spirits of the dead have come to him and pressed him to find the truth. He can't deny them. I liked Dr. Siri right from the opening pages. He exemplifies many of the characteristics that I believe in. Truth, doing a job to the best of your abilities, making the best of a difficult situation are just a few. Perhaps it is his curiosity and questioning nature that make him so real. The story also has a set of characters that I want to meet again. The nurse and orderly assigned to the morgue add greatly to the story. At first they seem unlikely aides, but as we get to know them, their dedication to Siri and the job become obvious. Police Officer Phosy is Siri's police liaison. He's a bit of a mystery, but seems to be united with Siri in finding the truth. I learned quite a bit about the geography and culture of Laos. It's a country I have no experience with and felt that Mr. Cotterill did a great job of bringing it to life for me. I am looking forward to reading more about Dr. Siri and his investigations. I listened to the audio book from Oakhill Publishing. Read by Gareth Armstrong. 8 hours 8 mins . Cover image courtesy Oakhill Publishing. 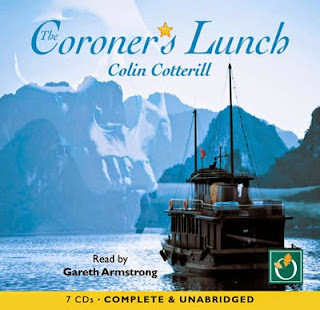 FYI, I am now most of the way through The Coroner's Lunch, and loving it!